Given the low levels of job vacancies toward the end of 2012 (see this previous post), I’m very surprised to see the strong rebound in employment in January (30,200 new jobs) and the unemployment rate dropping to 5.5% from 6.1% the previous month (from the new ABS Labour Force data). 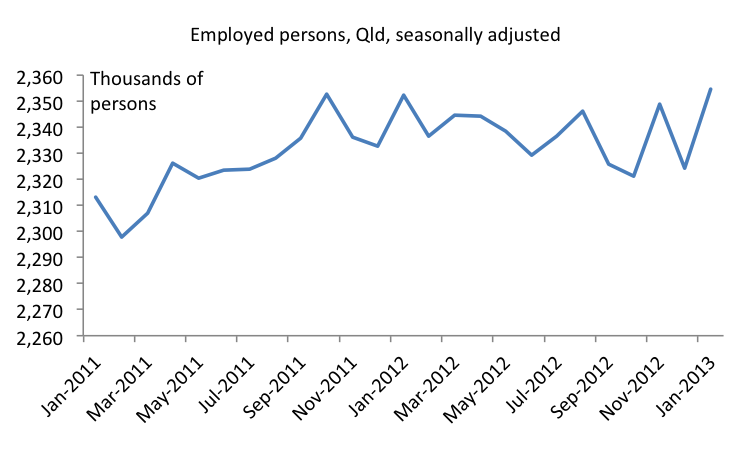 While I always expected the impact of Queensland Government job losses would be temporary (see my post on the temporary surge in unemployment), this appears to be a very sudden turnaround. I’m hoping it’s true, but I know there are reasons for interpreting today’s data cautiously. …as the ABS points out in their release, the data for QLD may well be compromised in Jan by the floods in the south east of the state. So, although this appears to be good news for QLD, we need to be cautious. Oddly, while it identifies the possible impact of the floods and bushfires in other States on the January data, the ABS notes “…there were no observable impacts on the data.” Frankly, I don’t think the ABS was looking hard enough. I’m increasingly disappointed by the quality of Queensland data produced by the ABS. I’d suggest the ABS review its sampling techniques and sample sizes to see if there are improvements that can be made to increase the reliability of Queensland data. This entry was posted in Labour market and tagged abs, australia, employment, labourforce, queensland, unemployment, unemploymentrate. Bookmark the permalink.